Rome (CNN) -- Prosecution witnesses at the trial of Capt. Francesco Schettino painted a picture of chaos aboard the Costa Concordia on the night the cruise liner sank, as they testified Tuesday in Italy. 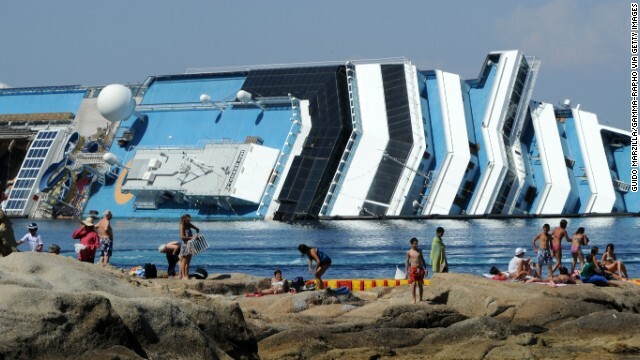 The cruise liner capsized after it struck rocks off Italy's Giglio Island in the Tyrrhenian Sea in January 2012, killing 32 of the 4,200 people on board. 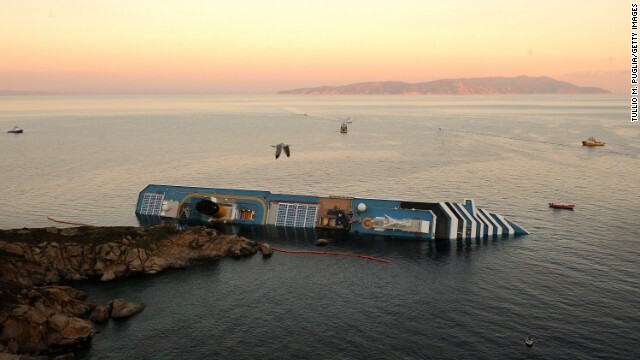 Schettino faces charges of manslaughter, causing a maritime disaster and abandoning ship with passengers still on board. He denies wrongdoing. 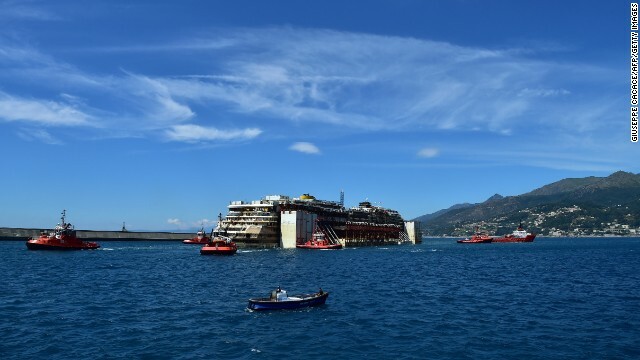 The refloated wreck of the Costa Concordia is towed to the Italian port of Genoa on Sunday, July 27, to be scrapped, ending the ship's final journey two and a half years after it capsized at a cost of 32 lives. 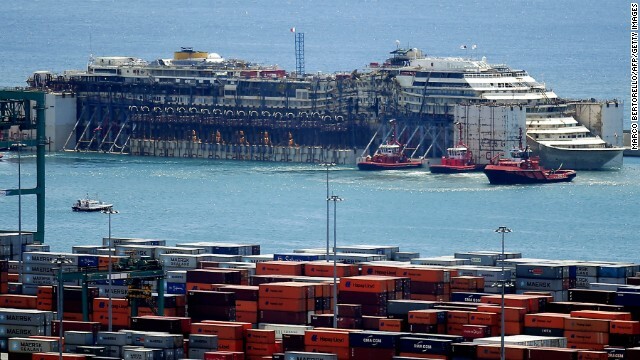 The Concordia is towed into the port of Genoa on July 27. 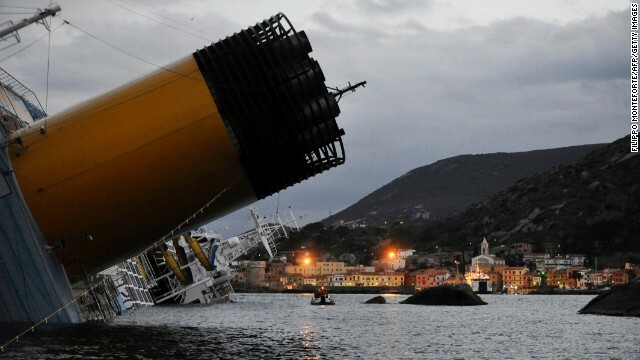 Tugboats tow the wreck of the Costa Concordia as it leaves Italy's Giglio Island on Wednesday, July 23. 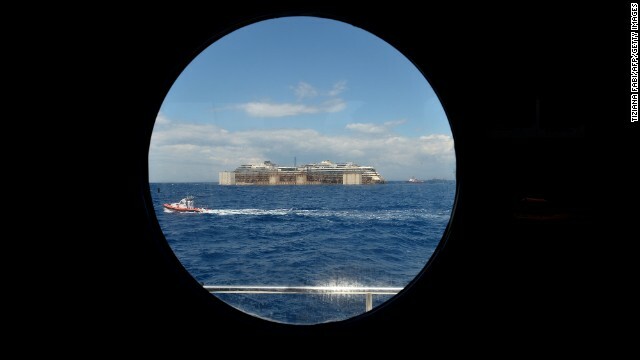 A view from a porthole shows the wreck of the Costa Concordia as it's being towed on July 23. It'll take about two years to dismantle the massive cruise liner. 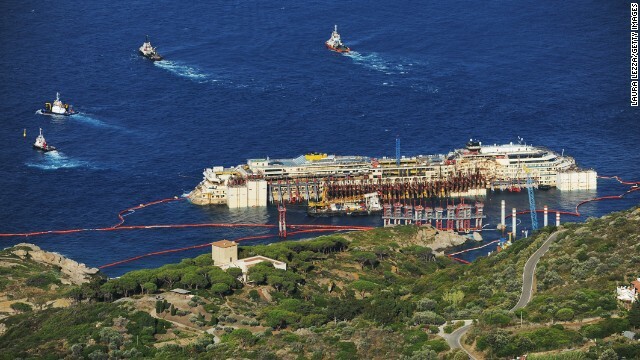 The Costa Concordia cruise ship sits in front of the harbor of Giglio Island after it was refloated using air tanks attached to its sides on Tuesday, July 22. 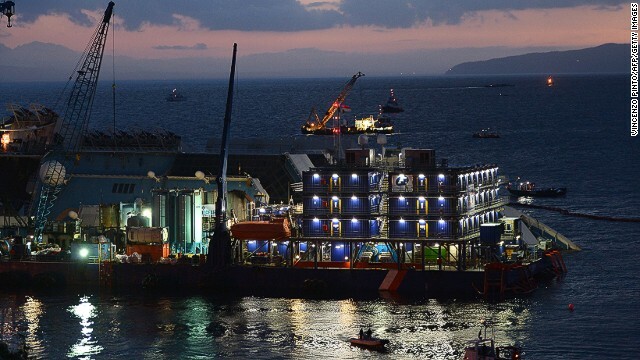 Environmental concerns prompted the decision to undertake the expensive and difficult process of refloating the ship rather than taking it apart on site. The ship's name appears above the water on Monday, July 21. The ship is expected to arrive in Genoa on Sunday, August 27. 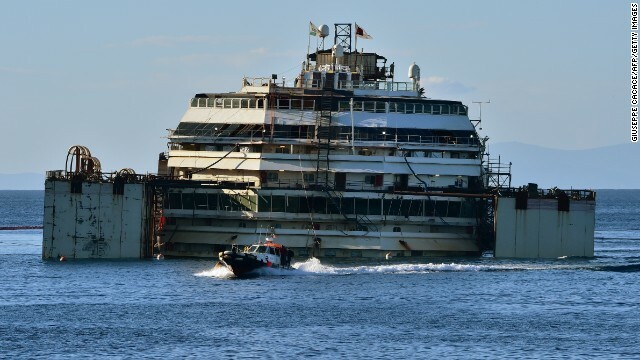 Tugboats pull the Costa Concordia after the first stage of the refloating operation on Wednesday, July 16. A small boat passes by the wreckage on Tuesday, July 15. 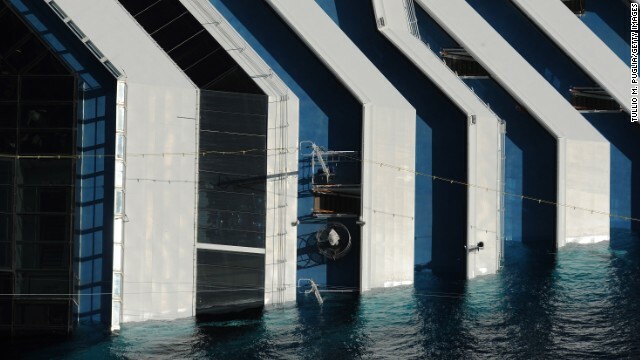 Water is expelled from the caissons hooked onto the Costa Concordia on Monday, July 14. The ship will be towed north to the port in Genoa, Italy. 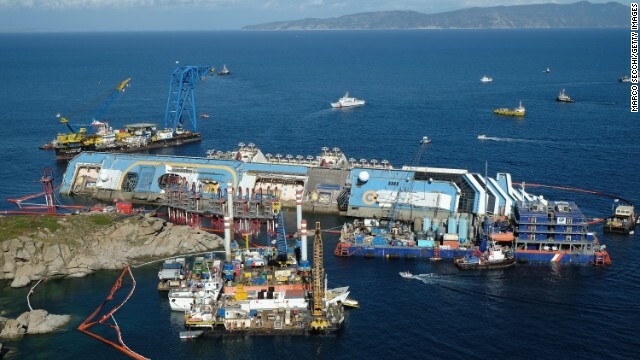 Thirty-two people died when the 114,000-ton vessel, seen here on July 14, ran aground off Giglio in January 2012. In December 2013, crews managed to rotate the ship into an upright position. To float the ship, seen here on Thursday, June 26, crews attached 30 steel tanks to fill with compressed air. 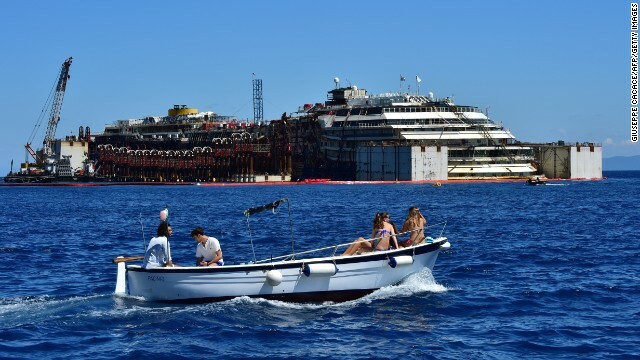 Ship captain Francesco Schettino, left, returned to the Concordia in February for the first time since he ran the liner aground. He is on trial on charges of manslaughter, causing a maritime disaster and abandoning ship with passengers still on board. He denies wrongdoing. Experts inspect the ship's damage in January. 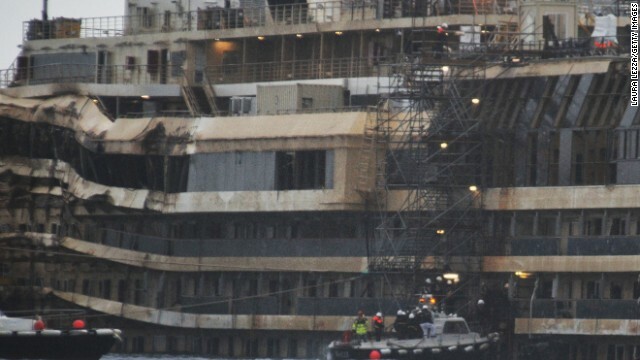 They boarded the vessel to collect new evidence, focusing on the ship's bridge and the onboard elevators. 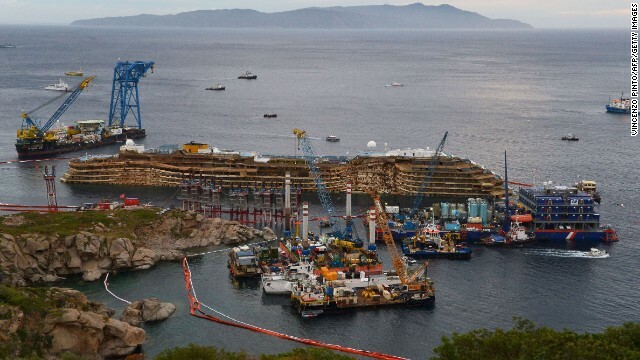 The wreckage of the Costa Concordia cruise ship sits near the harbor of Giglio on Tuesday, September 17, after a salvage crew rolled the ship off its side. 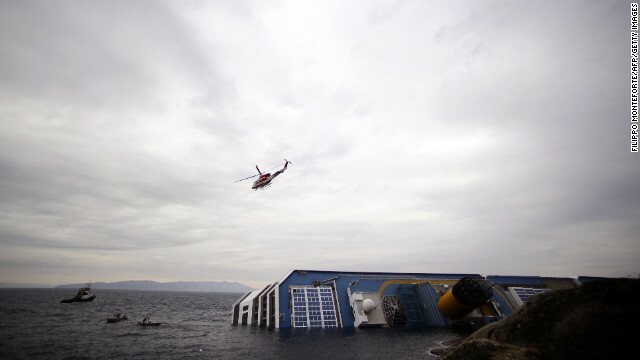 The ship had been lying on its side for 20 months off the island of Giglio. Here, members of the U.S. company Titan Salvage and the Italian marine contractor Micoperi pass by the wreckage. Damage to the right side of the ship is apparent in September. Using a vast system of steel cables and pulleys, maritime engineers work on Monday, September 16, to hoist the ship's massive hull off the reef where it capsized. 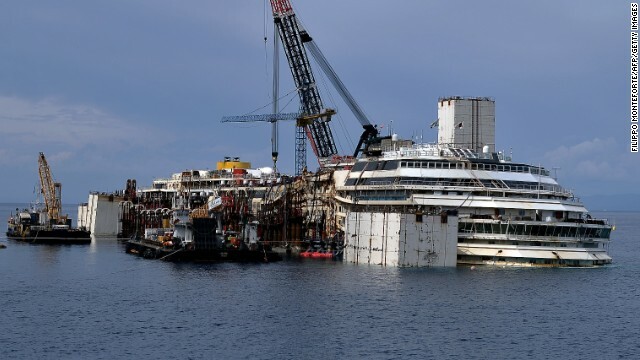 The project to upright the Costa Concordia continues on September 16. 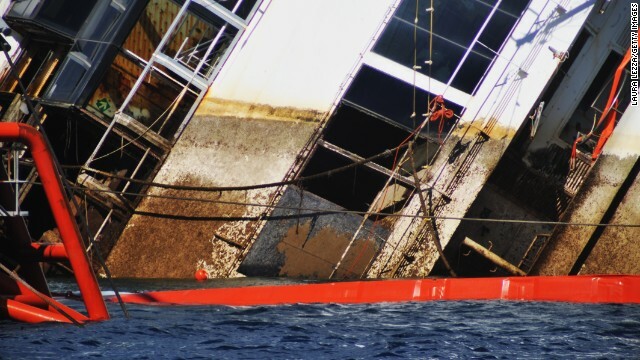 The nearly $800 million effort reportedly is the largest maritime salvage operation ever. 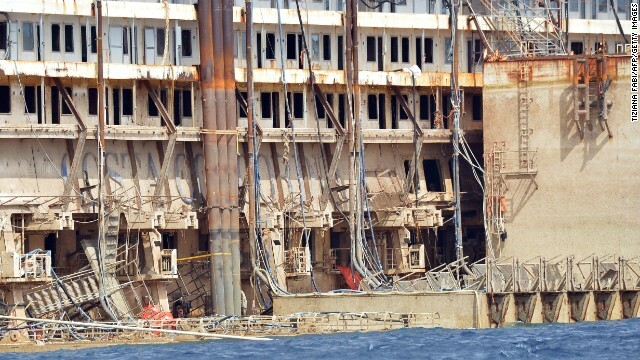 A water line marks the former level of the stricken Costa Concordia as the salvaging operation continues on September 16. 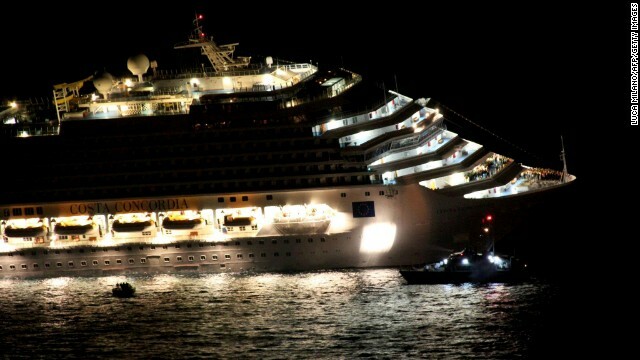 The procedure, known as parbuckling, has never been carried out on a vessel as large as Costa Concordia before. Members of Titan and Micoperi work at the wreck site early on September 16. 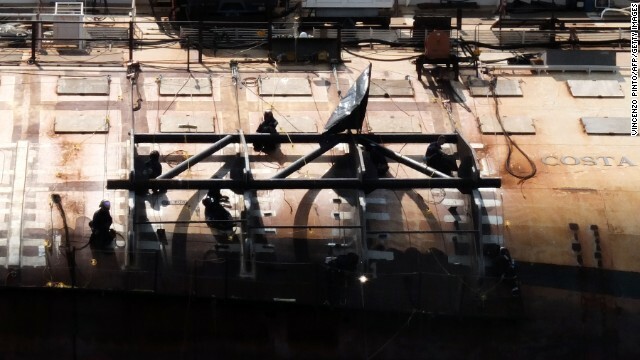 Technicians work to salvage the half-submerged ship in July 2013. Giant hollow boxes have been attached to the side of the ship, seen here in May 2013. Attempts to refloat the ship will be aided by the compartments. 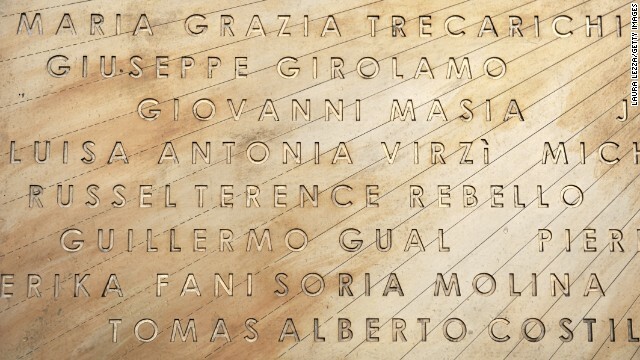 A commemorative plaque honoring the victims of the cruise disaster is unveiled in Giglio on January 14, 2013. 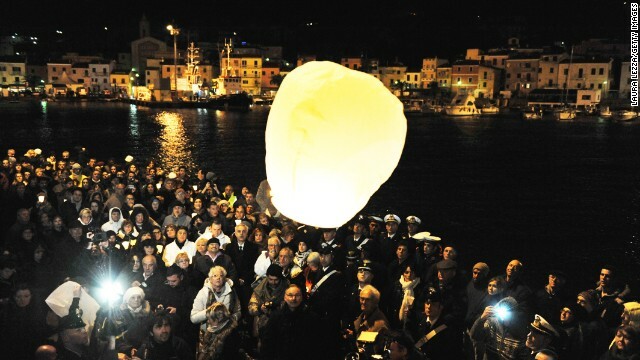 Survivors, grieving relatives and locals release lanterns into the sky in Giglio after a minute of silence on January 13, 2013, marking the one-year anniversary of the shipwreck. The 32 lanterns -- one for each of the victims -- were released at 9:45 p.m. local time, the moment of impact. 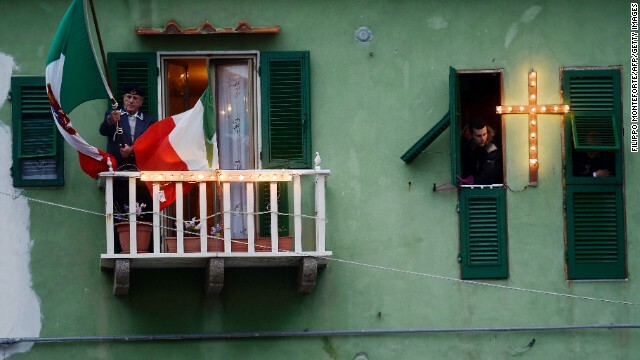 A man holds an Italian flag on his balcony overlooking the port of Giglio on January 13, 2013. 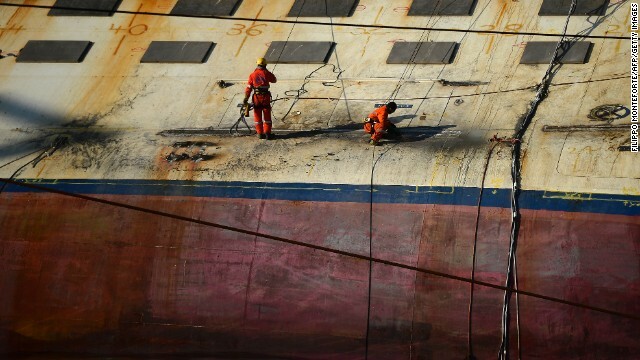 A man works in front of the shipwreck on January 12, 2013. 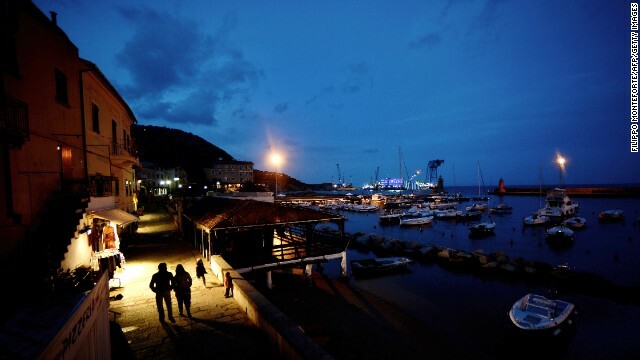 A couple walks along the port of Giglio at night on January 12, 2013. 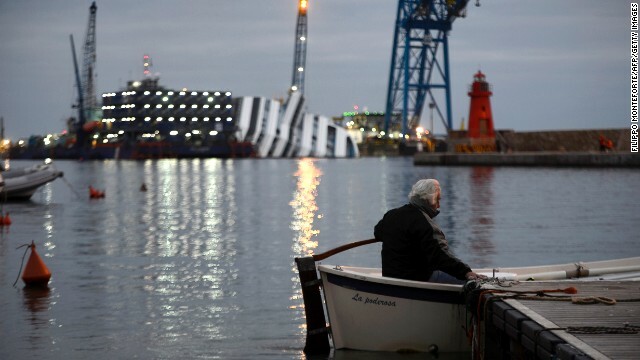 A man sits in his boat in front of the half-submerged cruise ship on January 8, 2013. Cranes and floating decks surrounding the ship light up the dusk sky on January 9, 2013. 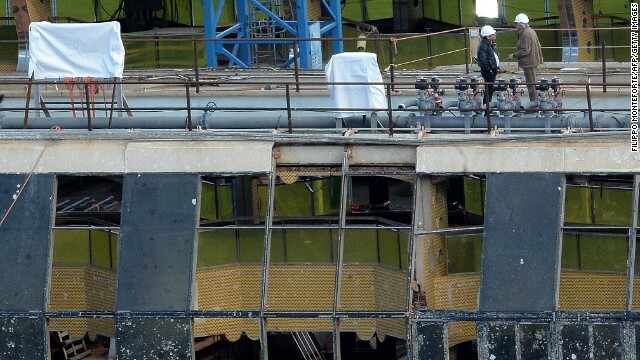 Workers stand on the edge of the ship on January 8, 2013. A crew passes by the hulking remains on January 7, 2013. People enjoy a day in the sun with a view of the cruise liner on July 1, 2012. 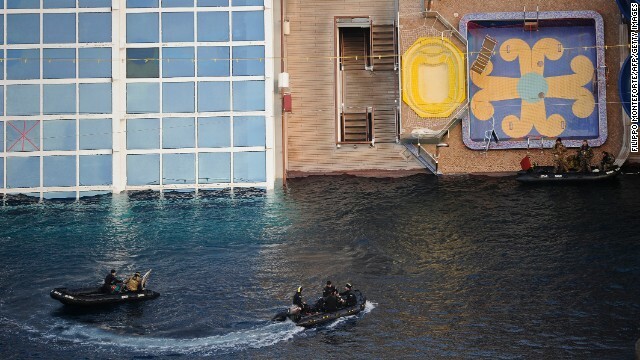 Military rescue workers approach the cruise liner on January 22, 2012. Members of the Italian coast guard conduct a search-and-rescue mission on January 21, 2012. 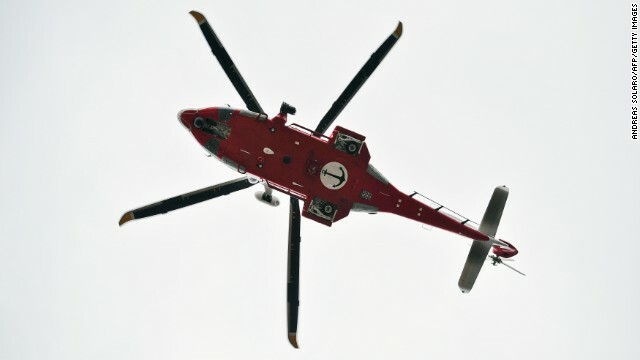 Rescue operations to search for missing people resumed on January 20, 2012, after being suspended for a third time as conditions caused the vessel to shift on the rocks. 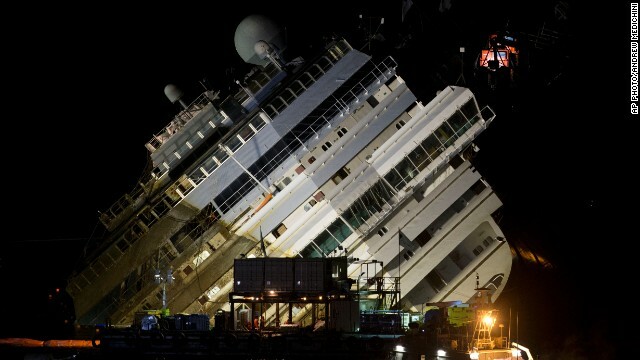 The Costa Serena, the sister ship of the wrecked Costa Concordia, passes by on January 18, 2012. A bird flies overhead the Costa Concordia on January 18, 2012. Rescue operations were suspended as the ship slowly sank farther into the sea. The ship was sailing a few hundred meters off the rocky Tuscan coastline. An Italian coast guard helicopter flies over Giglio's harbor on January 16, 2012. Rescuers search the waters near the stricken ship on January 16, 2012. 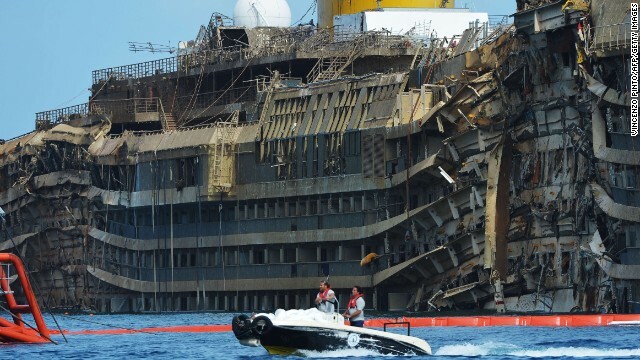 The Concordia, pictured on January 15, 2012, was on a Mediterranean cruise from Rome when it hit rocks off the coast of Giglio. The ship starts keeling over early on January 14, 2012. Evacuation efforts started promptly but were made "extremely difficult" by the position of the listing ship, officials said. 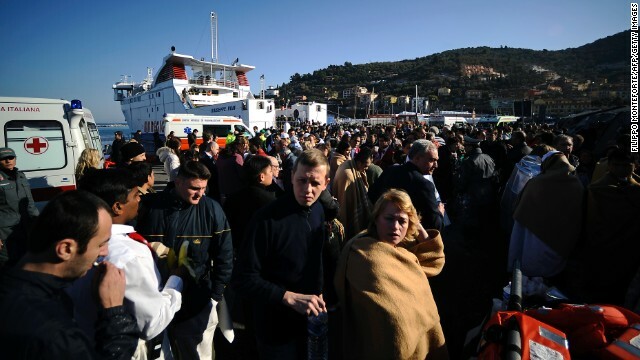 Rescued passengers arrive at Porto Santo Stefano, Italy, on January 14, 2012. 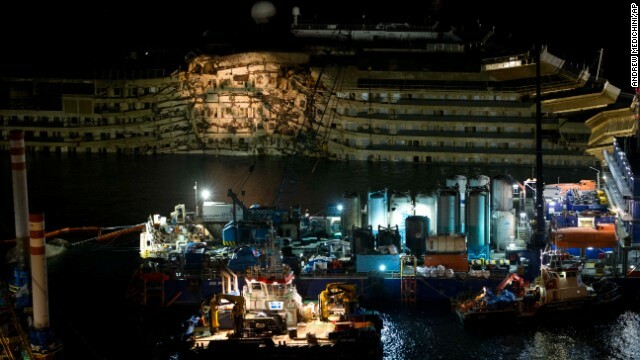 The Costa Concordia was carrying 3,200 passengers and 1,000 crew members. Among several key witnesses Tuesday, on the second day of prosecution testimony against Schettino, was Moldovan dancer Domnica Cemortan, who dined with the captain and was with him on the command bridge at the time of the accident. Cemortan, who boarded the ship as a passenger but had worked on another Costa Cruises ship captained by Schettino a few weeks earlier, conceded under questioning that she had been romantically involved with him. Everything seemed normal at first on the bridge, she told the court, but then she heard Schettino giving orders, and then "speaking angrily, yelling, to another officer" and telling him to obey the order. She heard the alarms go off on the bridge, triggering chaos and confusion. She heard a call from the engine room that "water had entered the ship." The dancer left the bridge with Schettino and crew member Ciro Onorato, she said, following them around the vessel because she wasn't sure where they were going. They ended up near some lifeboats, where "it was very slippery," she said. 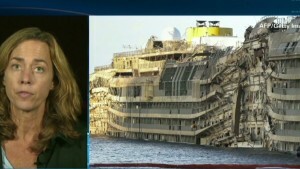 She and Onorato helped other passengers for about half an hour while the captain returned to the bridge, she said. Then Onorato pulled her into a lifeboat that also held other crew members. The boat hung over the side, and some panicked passengers fell into the water, she said. Cemortan said she has suffered psychological issues and taken medication to deal with the mass media attention after the wreck. She is also a party to the civil case against the captain. Onorato, who had dined with the pair, earlier told the court he was disappointed by Schettino's handling of events during and after the accident. Under cross-examination, Onorato was quizzed about Schettino's movements around the cruise liner and about how they both came to leave the ship. Onorato gave the same account as Schettino has given -- that the ship was falling on top of them and that they had no choice but to "fall" into a lifeboat. The defense also asked about Schettino's demeanor when he saw him on shore and whether or not the captain was trying to get back to the ship. 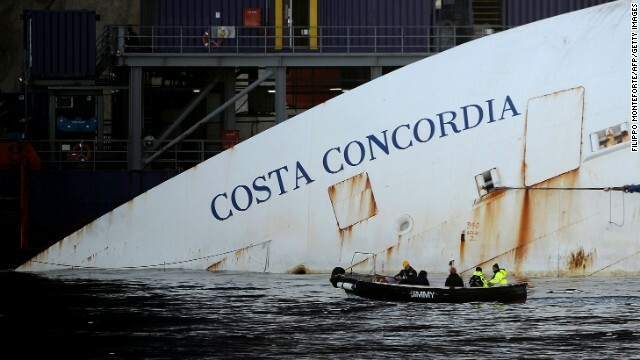 READ: Costa Concordia: Has master mariner in charge of salvage met his match? The prosecution also focused on why Schettino decided to sail so close to the island's rocky coastline. Another witness, ship's maitre d' Antonello Tievoli, a Giglio resident, said he had asked the captain to do the "flyby" a week earlier -- and he acknowledged feeling guilty about having done so. He testified that Schettino had told him that he was going to do a "close passage to the island" on the day of the crash, and that the captain had invited him on to the bridge so he could see it. Tievoli messaged his sister on Facebook to tell her the ship would be passing by moments before the accident. He was planning to point out where his house was on Giglio to Schettino and other guests on the bridge. Schettino asked him to call a retired Costa Cruises captain, Mario Palombo, who lived on Giglio to say they'd be passing close by, Tievoli said. Palombo was not on the island that night, but he and Schettino spoke by telephone. Tievoli told the court that he had done previous "close passages to the island," but none that close. Schettino had to ask the Costa Cruises company before changing his route and had done so before on a previous voyage, Cemortan said. Palombo, who took the stand after Cemortan, described Schettino as insincere and always hiding the truth, adding that he did not respect him. 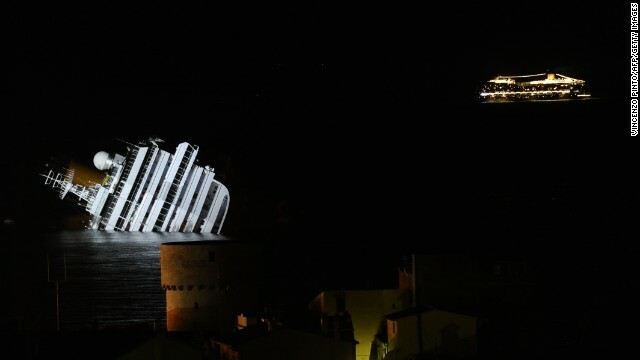 The retired captain said he had been surprised to get a call from Tievoli and then Schettino that evening because it was winter, so there were few people on Giglio to see the "salute," or close passage to the shore. 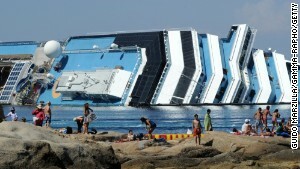 Schettino had asked him on the call about the waters around the island, he said. Palombo said a friend had then rung him, who said, "I saw a ship passing by so close, it is going to end up in the rocks ... I've never seen a ship passing by so close. The lights are off." Palombo said there was no set procedure for doing a "salute" and that the cruise line had never asked him to do one to publicize the brand. He'd done them only for his own sense of pride and seamanship, he said -- and always in summer and never with any "risky maneuvers." Tievoli testified that after the ship hit the rocks and alarms started blaring, he ran down to the restaurant to check the situation. He found a scene of chaos -- terrified passengers, with plates, food and glasses on the floor as the ship listed. The maitre d' told the court he left panicked elderly passengers in safe places where they wouldn't be hit by flying plates. He heard a message from the loudspeakers that the ship was suffering a blackout but did not hear the coded message for crew members only to prepare for emergency, Tievoli said. Once the general alarm was sounded, he and other crew members started preparing lifeboats so those on board could abandon ship, he said. He described lifting a man on crutches onto his back to carry him to safety. 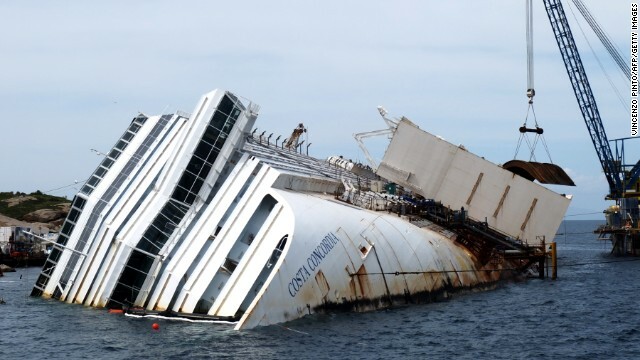 READ: Costa Concordia underwater: What's inside of wrecked cruise ship? Questioned by the defense, the maitre d' said he'd crawled down a ladder to jump on the roof of a lifeboat on the ship's upright side. Tievoli said he met the island's deputy mayor climbing onto the ship to save passengers, which could undermine Schettino's argument that he could not get back on board after "falling" into the lifeboat. The trial is expected to last through the fall with a string of witnesses, including passengers, crew members and islanders, who say they saw the captain on shore looking for dry socks before all the passengers had been safely evacuated. Schettino argues that he is a hero who saved the lives of more than 4,000 people, not a villain whose negligence led to the deaths of 32. His defense is trying to prove, among other things, that the ship's watertight doors did not function properly, and that is the reason the ship sank, leading to all 32 deaths during evacuation. 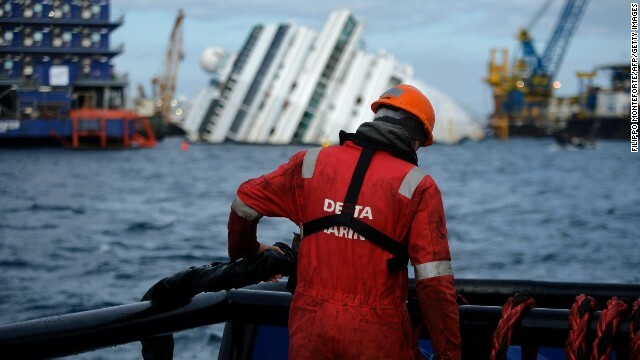 The captain also has told the court that the ship would not have crashed had his helmsman turned it in the direction that Schettino told him to 13 seconds before impact. The helmsman, Jacob Rusli Bin, and four others were convicted in a plea deal in July for their role in the disaster. A Florence court is considering the validity of those plea bargain agreements. CNN's Hada Messia and journalist Barbie Latza Nadeau reported from Rome. CNN's Laura Smith-Spark wrote in London. 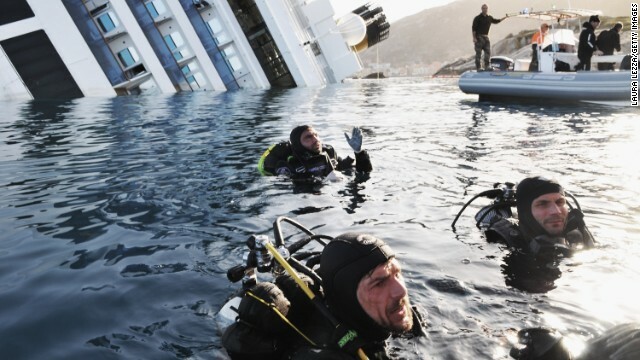 The captain of the wrecked Costa Concordia cruise ship faced questions over the change of course that led to its sinking. 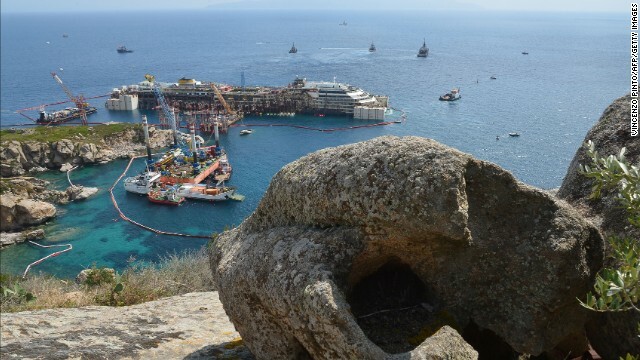 Nearly three years after the Costa Concordia cruise ship ran aground off Italy's Giglio Island, the remains of the final victim have been recovered. 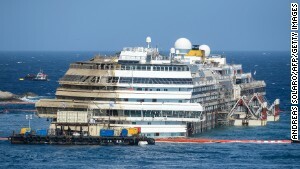 The crippled Costa Concordia cruise ship reached the end of its final voyage. 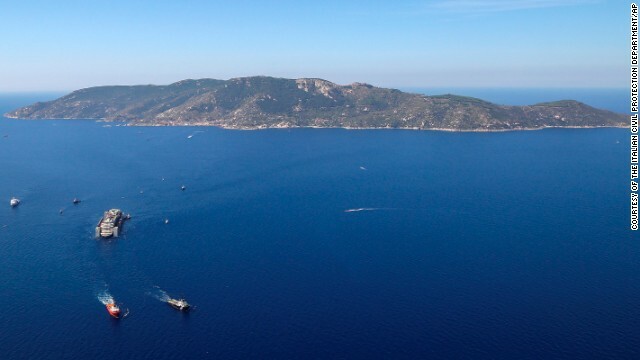 When the ship and its salvage convoy finally depart Giglio, the residents of this picturesque island will breathe a sigh of relief -- and shed a tear. It may be the biggest salvage operation in history, but no one would accuse it of being the fastest. How long does it take? How much does it cost? 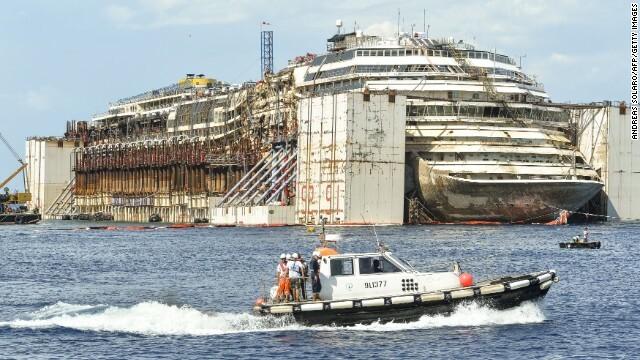 Here is salvaging the Costa Concordia, by the numbers. 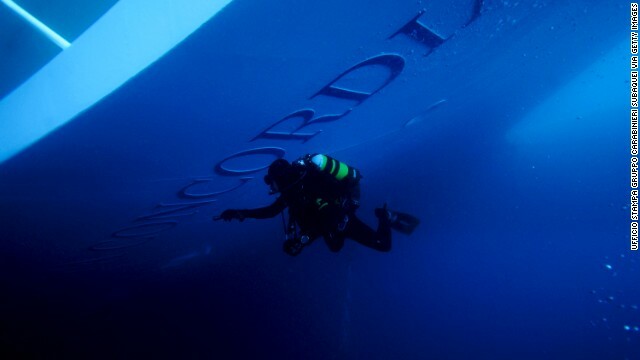 The nautical blue paint spelling out "Costa Concordia" has almost all bubbled and chipped off the bow of the once luxurious cruise liner. 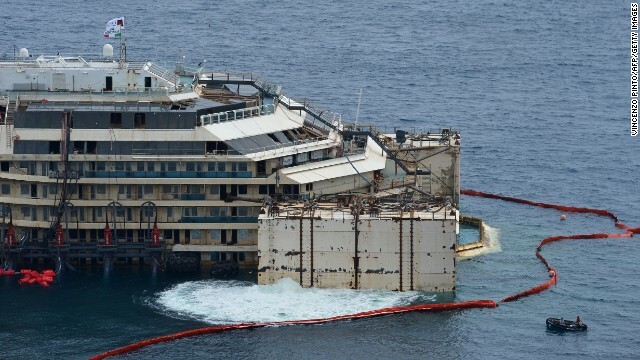 Nick Sloane: Has master mariner in charge of salvage met his match in the Costa Concordia? 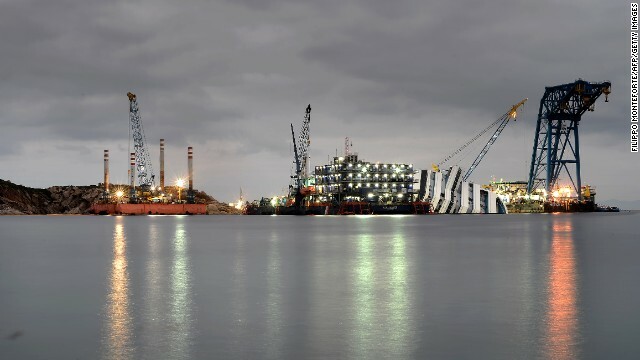 Browse our interactive to see how one of the largest cruise liners ever built will finally be raised from the Italian sea bed.